What happens when best friends break up? I mean, they were your side piece, your right arm, your dawg! What happened to the best relationship ever? When best friends break up, it can cut like a knife. I know first hand. My inspiration for writing this post about best friend(s) or relationships between friends happened long after we broke up. I ran across this letter floating around on Facebook just a couple of weeks ago. The woman was talking about the things she went through because of her best friend. I saw another article like the one I’m writing the other day, so I couldn’t ignore the signs any longer. You see, I wear those shoes… the ones torn and tossed aside because they are now ugly and broken. I could tell you a story or two from personal experiences with my best friend, but who hasn’t dealt with the effects of a break up between a friend or loved one? Sure, at first, when best friends break up, it will feel strange, providing you care or cared for your best friend. I know it’s hard to say goodbye, especially when the person has been in your life for so long. It’s hard to imagine the next get together without them or picture the next girl’s/guy’s night out and there’s no one sitting in their spot across from you. However, time should heal all wounds. Chances are you could have outgrown the places you and your best friend hang out as well. Why when best friends break up they don’t make up? It could be you’ve done yourself a great favor by evaluating the nature of the relationship and avoiding the negative attitude. If any relationship, including the one with your best friend, is making you unhappy, you don’t have to take it because you have time invested! When best friends break up and differences can’t be resolved, it’s time to move on. Remember, friendships are sort of like relationships in that, not every person will stay until the end. You meet people for a reason and sometimes, they lose their usefulness, no matter how we feel about them. You hear people talk about being loyal and devoted to their family and friends when all along, they dish out shade with a smile and show signs of hate and envy. They only pretend to encourage you or to be on your team. I mean, really, with frienemies like these… who can you trust? You know me, I say ‘Cut ’em.’ Yes, indeed – you need to get rid of the haters. When best friends break up, you may come up with every excuse in the book as to why they should remain your ‘friend’ but see, that’s the thing… they are not your friends. How can you tell? I’ll tell you. If you and your friend have an argument, and they automatically “break up” with you, then they were likely not a loyal friend. When best friends break up but your friend hasn’t made any steps to resolve the issues between the two of you, you should probably let go. Have called too many times and they still won’t answer the call? You need to move on. How did best friends get this far? When best friends break up, you wonder how did you guys get to this point? It wasn’t always this way. You may have not even seen it coming, but on the other hand, you may have had a funny feeling a time or two but ignored it. Do you remember a time when you wanted to talk about what’s going on with you and your friend would change the subject? Un huh, yeah… that was a sign. At the same time, when you had some good news, were they the one to rain on your parade? A true friend would be happy for you when you announce you’re having a baby or buying a new car! You want to have healthy relationships and friends which motivate and uplift you. Does your friend always find fault with what you do? Do you feel like your friend is passing judgment on you? Can you be yourself or do you feel like you have to be a different person around your friend in order to get along? Are you’re treating your friend differently because she’s acting funny? One of the stories talked about how the lady’s ex-friend had a way of pointing out how different she was and that she was bold to wear something like that or to wear her hair that way. On the surface, you’d say, there’s nothing wrong with that, but it made her friend feel like she was the weird one. Her friend was just being the person she was meant to be. So what, if she likes nappy hair and later, it became a popular style of wearing natural hair. So, she wasn’t so weird after all, or on the other hand, maybe thousands of other people are weird, too. Her friend was also a hypocrite. She would give the ‘odd’ friend the evil eye because some of her friends are of other cultures, races, and backgrounds. She claims she doesn’t care for “those” people, but yet sleeps with a man outside of her race … and she’s married! Oh, the lady writes to say her excuse was ‘eating ain’t cheating,’ but constantly called her friend a sleaze because she dated a few men over 20 years ago. All the while accusing her of holding on to the past too much. Contradictions, right? 2Call me, girlfriend… we’ll hook up! Your friend says you guys will get together, but then when you call, they say they are sick, but you see the time stamp on Facebook that suggests otherwise. Or when you call to make plans, they are too busy this week and want to know if they can call you back, but never do. A person who wants to see you will make arrangements to do so. You have to make time for close friends, and relationships. 1Who cares when best friends break up? It’s my defense and my flaw. When I’ve stopped caring, it’s best we part company anyway. Saying I don’t care means I have sorted through the madness and there’s nothing left to salvage. I don’t care means I’ll be okay without you. I’m okay with being my dog’s best friend. When best friends break up, it can be extremely difficult and painful. However, you must love yourself first, or nobody else will. Do what you have to do in order to have healthy, restorative relationships without guilt or shame. Read more about breaking up with your best friend by purchasing these or similar books. 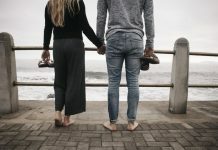 Previous articleWhy Do Women Settle for Less in Relationships? Next articleCan You Spot Fake Dating Profiles?